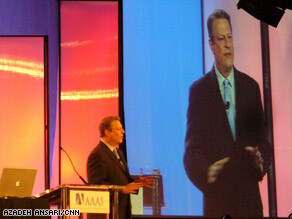 Former Vice President Al Gore addresses the American Association for the Advancement of Science. -Saw Gore's presentation: Given that pop-culture conferences have concerts as their evening highlights, it makes sense that the AAAS would have America's climate-change rock star - who recently won a Grammy, no less - to get people on their feet. More than a thousand scientists, journalist, educators and students greeted Gore with a standing ovation as he took the stage. In his speech, Gore identified a common thread between global warming, our national security and the world financial meltdown - our "absurd" dependence on carbon-based fuels. When you pull on the thread, he said, "then all three of these crises can begin to unravel.” The solution: shifting to an infrastructure based on fuels that are free, such as solar and wind power, and bolstering the science of clean and sustainable energy. Gore seemed optimistic about Obama’s appointments to the Cabinet and the direction our country is taking to address the issue of climate change, which he called "a historic struggle." He emphasized the importance of us all working together as a species in order to prevent further threats to the entirety of human civilization. Through a series of slides, which included the most recent scientific findings on climate change, Gore communicated his "inconvenient truth" to the audience while urging scientists to get more involved in their communities. He also called on scientists to get involved in politics, to speak out as “civic scientists” and to “find ways to communicate the truth." He concluded by saying, “Keep your day job, but start getting involved in this historic debate. We need you." P.S. Gore uses an iPhone, too - he had to turn it off during the speech. 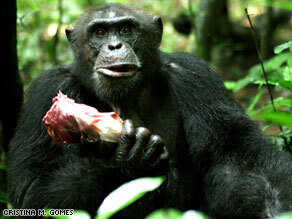 -Learned about stem cells: Bone marrow is one important source of adult stem cells, researchers say. And did you know that humans make 10 billion red blood cells every hour of every day? Dr. Will Li of the Angiogenesis Foundation talked about the potential of endothelial progenitor cells in the marrow for treatments of conditions such as diabetes. -Got in touch with our emotions: People commonly feel better by writing their feelings down, and now scientists are beginning to understand why. Brain-imaging studies indicate that putting your feelings into words has the effect of regulating emotions, said Matthew Lieberman of the University of California, Los Angeles. More from the conference: learn about a face transplant patient, think about foods of the future, and ponder Darwin's connection to Buddhism.